Big Dot of Happiness Par-Tee Time - Golf - Confetti and Balloon Birthday or Retirement Party Decorations - Combo Kit by Big Dot of Happiness at WP Ultimate Social. MPN: BD4250bck. Hurry! Limited time offer. Offer valid only while supplies last. Make a statement at your next party with the Par-Tee Time - Golf - confetti and balloon retirement party, baby shower or birthday party combo kit! Make a statement at your next party with the Par-Tee Time - Golf - confetti and balloon retirement party, baby shower or birthday party combo kit! 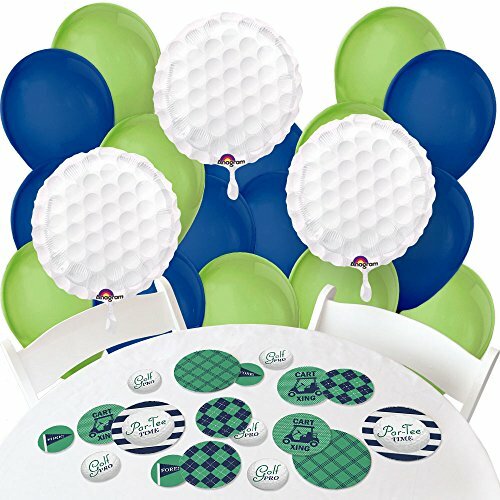 This kit contains 3 - 18" golf shaped mylar balloon, and a 16 pack of 11" green and navy blue latex balloons and 27 piece table confetti. Balloons are a perfect and inexpensive way to add color and fun to your next event. The shaped balloon requires helium to be blown up and the latex balloons can be inflated using helium or blown up with air. Easy, simple party decorations for your retirement party, birthday party, baby shower or any kind of celebration. Par-Tee Time - Golf Confetti and Balloon Decoration Kit INCLUDES 3 large golf ball foil balloons, 16 coordinating latex balloons and 27-piece table confetti kit. Par-Tee Time - Golf balloon combo kit is the perfect party decoration for a retirement or birthday party. IMPRESSIVE BALLOONS: Par-Tee Time - Golf balloon kit includes both shimmering foil and latex balloons. Set of 3 large golf ball balloons includes 3 - 18" golf ball balloons. Set of 16 coordinating latex balloons includes 8 green latex balloons and 8 blue latex balloons. Balloons will ship flat but can easily be inflated with helium or air prior to your celebration. LARGE TABLE CONFETTI: 27-Piece Par-Tee Time - Golf giant circle confetti comes in a variety of coordinating patterns in three different sizes, 6 - 5.5" party circles, 9 - 4.25" party circles, and 12 - 2.75" party circles. Scatter them down the length of your party tables, add them to centerpieces or hole-punch them and string together as a retirement or birthday party banner. Navy and green paper confetti pieces will make a statement however you choose to use them. PREMIUM PARTY SUPPLIES: Par-Tee Time - Golf giant circle confetti is professionally printed on heavy-duty cardstock paper with a photo-like shine. Party circles are individually inspected and carefully packaged by hand, along with the foil golf ball balloons and coordinating latex balloons. Par-Tee Time - Golf party kit will arrive flat. The foil balloon require helium; the latex balloons can be inflated using helium or blown up with air. Get creative with your DIY party ideas! Par-Tee Time - Golf - Confetti and Balloon Birthday or Retirement Party Decorations - Combo Kits designed at our Wisconsin facility using materials that are Made in America. If you have any questions about this product by Big Dot of Happiness, contact us by completing and submitting the form below. If you are looking for a specif part number, please include it with your message.